Identification: Adults are brilliantly marked with contrasting green or blue colored bands and spots on a black or brown background (several color morphs exist). These small frogs are about 25-60 mm long as adults, and the all black tadpoles range from around 22 mm to as large as 45 mm. Current Distribution: Established on the island of O'ahu, Hawaii in addition to the original distribution. Site and Date of Introduction: In 1932, 206 individuals collected from either Toboga or Tobagilla Island off the Pacific coast of Panama were purposely introduced into upper Manoa Valley, O'ahu. Mode(s) of Introduction: An entomologist working for the territory of Hawai'i introduced this species intentionally for the biocontrol of non-native arthropods (particularly mosquitos). Reason(s) Why it has Become Established: Parental Care: These frogs are adapted to moist tropical forests (humidity ~80%) making them prime candidates for life in Hawaii's wet valleys. They are dependent upon standing water only for the tadpole stage, and due to their complex parental care behaviors are able to utilize very small puddles and water trapped in bromeliads for larval development. Females lay eggs on land which are guarded by the male until hatching, at which time the tadpoles are carried on the adults' backs to standing water. Tadpoles may even be moved between pools as necessary. These kinds of behaviors may aid in circumventing high reproductive losses due to variability in water availability, and may allow this species to avoid competition or predation by other species in Hawaii's streams. Chemical Defense: Being chemically defended and aposematically colored may reduce the predation rate on adult frogs of this species relative to other amphibians in Hawaii. Frogs in the family Dendrobatidae produce over 300 powerful skin alkaloids. 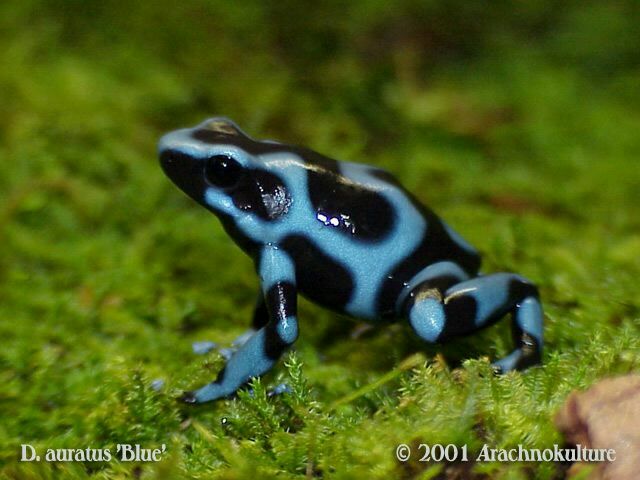 In nature these toxins serve a defensive purpose; indeed, D. auratus has very few natural predators. However, some snakes have evolved immunity to these compounds and are thus able to prey upon adult dendrobatid frogs in their native habitats, and there are also anecdotal reports of predation by birds. Such an adaptation is the result of a long evolutionary history of interaction which would not exist for the introduced population in Hawaii and any potential predators (most of which are recent introductions too). Interestingly, the chemical precursors to the compounds found in dendrobatids are sequestered from arthropod prey in their native habitat which are presumably absent from Hawaii. Therefore the toxicity of this population is probably greatly reduced compared to the toxicity of the founding individuals. However, it may be that the warning coloration alone is enough to reduce predation. It may also be that this species is unpalatable--albeit to a lesser degree--even in the absence of its native prey. 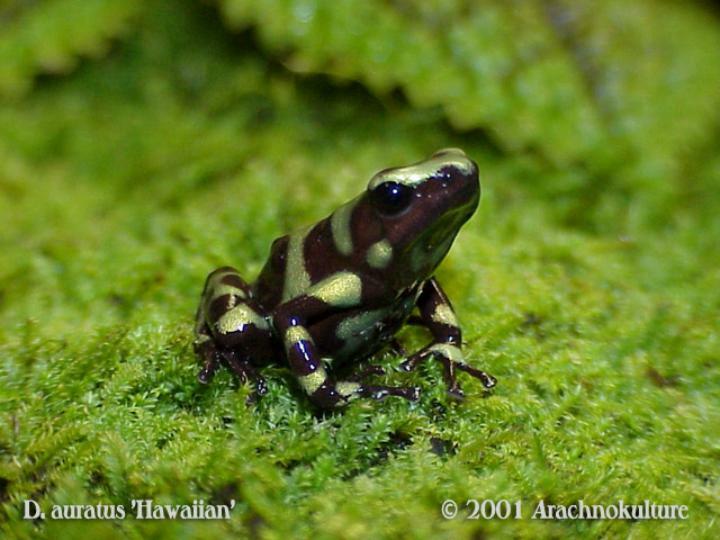 Ecological Uniqueness: The amphibian fauna of Hawaii is small (yet growing); only a handful of other frogs were established at the time of D. auratus' introduction, none of which are aposematically colored, and only one which is not primarily aquatic (Rana catesbiana, Rana rugosa, Bufo marinus). This situtation of ecological uniqueness may be changing with the recent addition of three species of Caribbean frogs from the genus Eleutherodactylus which has practically doubled the current amphibian fauna of Hawaii (E. coqui, E. planirostris, and E. martinicensis). Eleutherodactylus species are potentially formidable competitors for D. auratus since they are about the same size and they both utilize similar habitats and prey resources, traits that have been shown to lead to exploitation competition and displacement in gecko lizards in Hawaii (although D. auratus is diurnal and the Eleutherodactylus species are nocturnal). The Eleutherodactylus species also can occur at very high densities and can withstand broader ecological conditions. Finally, the Eleutherodactylus species undergo direct development, reducing their dependence on water even further and contributing to their rapid generation times. To date it does not look like these species are overlapping in range, but there does exist potential for future interaction. Ecological Role: Amphibians can play important roles in regulating invertebrate food webs. D. auratus was introduced for this very reason: to control insect pests. Whether or not this species is consuming native or non-native arthropods and what impact their introduction has had on native food webs is unknown. However, this species occurs in lowland habitats on the island of O'ahu which are primarily composed of introduced species, so impact on native arthropods is probably trivial at this point. As secondary consumers, amphibians are often important intermediaries in higher order food chain interactions as they convert the prey biomass of small arthropods into a form available for larger predators. As mentioned previously, it is unknown if D. auratus is being preyed upon by any other animals in this system, but it is unlikely that this is occuring. In their native habitats D.auratus engages in mutualistic relationships with the bromeliads in which tadpoles develop. The bromeliads provide a safe place for the tadpoles who feed on insects and detritus, as well as on unfertilized eggs deposited for them by the adult female. The bromeliads benefit from the nutrients that the tadpoles add to this mini-system. Water-retaining plants are present in Hawaii and may be utilized by introduced D. auratus. Benefit(s): The consumption of non-native arthropods is a potential benefit of having this species in Hawaii. Besides the direct effect of reducing populations of undesirable arthropods, D. auratus may also be indirectly reducing the plant damage caused by herbivorous arthropods, as has been shown for experimental Anolis introductions in the Caribbean. A potential economic benefit is bioprospecting for new medicines within the large family of dendrobatid toxic skin compounds. D. auratusproduces a pumiliotoxin that might have applications as a cardiac stimulant following heart attacks in people. A compound produced by another Dendrobatid frog, Epipedobates tricolor has been shown to be effective on the same range of pain as morphine yet wihout that drug's negative side effects. Threat(s): Since there are no native amphibians to affect, any negative impacts of this species would most likely be felt through direct effects on arthropod populations and indirect effects on food webs. Again, the dynamics of this community are unknown. Control Level Diagnosis: This species has been established in Hawaii for several decades without incident, suggesting that it is a low-impact and relatively benign species. While the potential always exists for changes to occur that could promote a population explosion, the chances of this happening in the Hawaii populations of D. auratus is probably small. To answer the question of whether or not this species will become a problem in the future requires information about what is limiting the current population, and the ability to make predictions about the likelhood of future changes that may alter population size. Any population boom due to initial ecological release would already have been observed, and if anything this species may be accumulating competitors and predators over time, thus further reducing the likelihood of an explosion. Compared to the introduced Eleutherodactylus species, which within a decade from their introduction are already regarded as a serious threat to ecosystems and industries in Hawaii, D. auratus is not a high priority species of concern and should not be controlled. Control Method: Laboratory trials have identified concentrated caffeine solution as a potential control tool for the Eleutherodactylus frogs, presumably this agent would be effective on D. auratus as well. As mentioned above however, there is no reason, ecological or otherwise, to pursue an eradication campaign against this species at this time. Funds are better spent on preventing the introduction of known detrimental species such as the brown tree snake, Boiga irregularis, and on the mangement, control and eradication of other established species that have proven to be or are feared to be harmful to Hawaii's ecosytems. Duellman, W.E. and L. Treub. 1986. Biology of Amphibians. The Johns Hopkins University Press, Baltimore and London. Master, T.L. 1999. Predation by Rufous Motmot on black-and-green poison dart frog. Wilson Bulletin 111(3): 439-440. David Cannatella, Linda Ford, and Lori Bockstanz. 2001. Neobatrachia "Higher Frogs. Tree of Life.